Thaksin Shinawatra, the billionaire telecom tycoon who served as Thailand's Prime Minister before being ousted in a military coup, may be a billionaire no longer. On Friday, Thailand's Supreme Court ruled that the government could seize $1.5 billion of the fugitive politician's $2.3 billion in frozen assets after concluding he had enriched himself at the expense of the state through abuse of power and conflicts of interest when he led the country from 2001-2006. The court ruled that the remaining $800 million will stay frozen pending calculation of interest and the settling of other cases and claims against Thaksin. The majority decision, at once stunning yet expected, was the highest-profile corruption case ever to come before a Thai court and one of the most controversial. The ruling risked further fracturing Thailand's already deep political divide between those who back the ousted Prime Minister and his opponents. Police and military officers were on full alert across the country, fearing that Thaksin's supporters might riot if the verdict went against him. But while the streets of Bangkok were calm immediately after the verdict was read, Thaksin's allies vowed to hold a massive protest in Bangkok on March 14 to bring down the current government. Thaksin, who recently claimed in a newspaper interview that he was down to the last $100 million or $200 million of his fortune, though he has an unknown amount of money stashed overseas, had urged his supporters earlier Friday to accept the court's decision, whatever it might be. He spoke via video from an undisclosed location, having fled the country in 2008 rather than serve a two-year prison sentence for an earlier conviction on conflict of interest charges involving the sale of government land to his wife. He also told supporters that if the ruling went against him, he would take his case to the International Court of Justice in The Hague. The ICJ, however, only decides on cases of international law, or issues advisory opinions at the request of U.N. agencies. A Thai government spokesman told local newspapers that it is unlikely the ICJ would accept Thaksin's case as it is not in its jurisdiction. 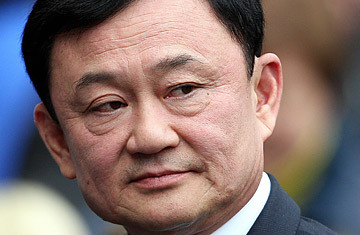 In its ruling, the Supreme Court found that Thaksin had abused his power as Prime Minister by issuing executive decrees that gave his company, Shin Corporation, hefty tax breaks and tax holidays, among other actions, thereby decreasing the revenue it shared with the state for its telecommunications concessions. The court also concluded that Thaksin, in violation of Thai law, still controlled the company while serving as Prime Minister. He accomplished this, the court said, by using family members and others as nominees and transferring shares in an intricate web of deals through offshore companies in the British Virgin Islands and other tax havens. Thaksin sold Shin Corporation to Temasek Holdings of Singapore in early 2006 for $1.9 billion. The court called that money "ill-gotten wealth." Thaksin claims that all of his assets were earned before he became Prime Minister. Thaksin was elected Prime Minister twice  in 2001 and 2005  before being ousted in a military coup in September 2006. At the time, military leaders cited his unbridled corruption and alleged disloyalty to the country's monarchy to justify their action. Under international pressure, the generals stepped down and allowed elections to return a civilian to power after a little over one year of rule, but they still wield considerable power. Although Thaksin has been banned from politics for five years for violating election laws, he remains popular with the rural poor, who feel he was the first Thai leader to address their needs by implementing social welfare programs, such as universal health care. His supporters believe he is being selectively targeted by his political enemies, while his opponents feel he is paying the price for blatant conflicts of interest and abuse of power. Both Thaksin's supporters and opponents have a history of inciting chaos and violence in the country. His supporters, called the "Red Shirts" for the color they wear, rioted in Bangkok and Pattaya last April, forcing the cancellation of a summit of Association of Southeast Asian leaders and bringing the army onto the streets of the Thai capital to restore order. Thaksin, who had portrayed himself as a fighter for democracy, lost international credibility when he denied the Red Shirts were inciting unrest even as they were shown on television physically attacking the car of current Prime Minister Abhisit Vejjajiva and beating and injuring one of his aides. Thaksin's opponents, called the "Yellow Shirts" for their preferred garb, seized Government House, where the Prime Minister's office is located, and New Bangkok International Airport in 2008 as part of their efforts to oust the elected Thaksin-allied government, which they believed was preparing to dismiss all the cases against him, paving the way for his return to power. That seems ever more unlikely after Friday's court decision, although both Thaksin and his supporters are certain to continue to fight for his eventual return.